Can one of Britain’s biggest screen icons take on one of the most iconic literary figures? The answer is elementary, my dear movie minions. Sublime. From the moment, the stern sleuth corrected a child on his error for mistaking a wasp for a bee, I knew I was for in a treat. A superb performance from Sir Ian McKellen. 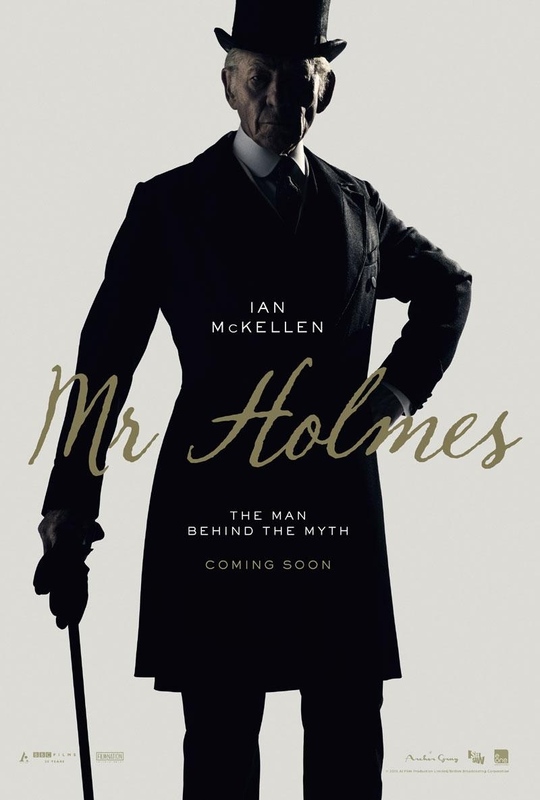 An aged, retired Sherlock Holmes (Ian McKellen) looks back on his life, and grapples with an unsolved case involving a beautiful woman (Hattie Morahan). I’m not the world’s biggest Sherlock fan. The endless entries and reboots in both TV and film, despite having two charismatic leads, in Robert Downey Jr and Benedict Cumberbatch were overlong, over-hyped and needlessly complex. Watchable enough. However, this take on the man behind the myth made for good viewing. McKellen’s charisma really carried the film as Mr Holmes attempts to recollect the details of his last case. The case that he never solved and forced him to exile to the pastoral countryside. If you’re expecting an affair like the RDJ movies and Cucumberbatch TV series, you may be left disappointed. This is very much a slow burning yarn as Holmes must re-evaluate his life’s work and come to terms with his own mortality. They really made McKellen look old and haggard. I mean obviously the screen icon is 76 but it’s mad how a few more lines and a hunched posture can change everything. The story line flicks back and forth. Each flashback a little disjointed piece of a bigger puzzle. The only niggle I had with the continuity is that McKellen only looks a few years younger when the case is supposed to be 30 years old. Tut tut tut. McKellen can act as spritely as he wants. He can’t hide those greys. But only a niggle. The structure worked really well as each development of the case coincided with a development in Holmes’ condition. The case appears relatively simple. A suspicious husband curious of his wife’s activities. BUT of course in typical Holmes fashion, not everything is as it seems. Hattie Morahan (The Bletchley Circle) played the wife well. BUT the case, for all its anticipated mystery and suspense, was a little disappointing. The puzzle solving was fun enough. BUT the unravelling wasn’t really that riveting or as rewarding as I hoped. I was left wanting. There was one sobering moment that did surprise me. BUT the fantastic supporting cast were not used to their full potential and that was down to their poor characters. Frances De La Tour (Rising Damp) certainly did a better job at a German accent than she did an American one in Survivor. BUT for all her flamboyance, the character was merely a weak red herring. Roger Allam (The Queen) did the best that he could with his stoic doctor role and Philip Davis (Vera Drake) was merely a passing cameo with his detective. Shame. What did stand out for me was the myth breaking of the man. The jokes about his deer stalker hat and pipe were brilliant. Merely for McKellen’s reaction. “I don’t smoke a pipe! I like the occasional cigar”. I did get a chuckle as the miserable mystery man laughed at one of his latest screen offerings at the local pictures. Tutting and sighing away at the stupidity and inaccuracy of it all. His constant complaining of Watson’s exaggerations on his appearance, cases and life were entertaining. Holmes’ memory loss made for sombre viewing. Forced to write dots in a diary when he forgets a name, place, date. It really hit home when Holmes couldn’t even remember the name of the housekeeper’s son Roger (Milo Parker) whom he had grown fond of. Quickly looking to the name he had written on his cuff. McKellen and Parker were brilliant together. A stubborn old man versus a deductive, energetic fan. Parker will certainly be one to watch for the future. A strong performance. I really liked their relationship and it lightened the tone of a very serious case. A surrogate Watson, if you may. Unfortunately, I can’t say I was too impressed with Roger’s mother. Laura Linney’s housekeeper was a mixed bag. I loved her in The Big C and I certainly felt for her character as she struggled to keep up with her son’s developing intellect. BUT what didn’t help was that her accent was so muddled. She really couldn’t grasp it and you could tell. It really grated against me. Each line felt like the bellow of a strangled cat. Well, maybe not that bad. The story did lag in places and dither into random tangents which did have me questioning, “Where was this going?”. A quest for a miraculous herb known as ‘Prickly Ash’ in Japan felt a little out of place. BUT it allowed for a harrowing, if brilliantly shot sequence as Holmes ventures through the aftermath of Hiroshima. It also unearthed Holmes’ desperation to fight his ailing condition. Hiroyuki Sanada (The Last Samurai)’s herb finder role seemed too tame and a thin subplot involving his father didn’t seem to make much sense. However, the final quarter was unexpected. And all the little questions I had soon fell into place rounding everything perfectly. I went in expecting nothing and was rewarded with something more. I just wish that Holmes’ last case was much more memorable for the cast and the man. BUT the closing moments were written brilliantly and acted to perfection. McKellen is everything you could imagine. The cast did their best. The case left little for desire. BUT I would still recommend.